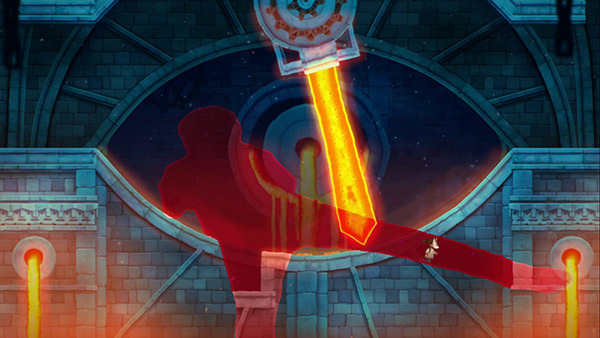 While FRU is guilty of both a very short length and several frustrating moments, it still ends up being one of the most clever and successful uses of the Kinect around. While new releases relying on the Xbox One Kinect seem to be coming to an end, this hasn’t stopped Netherlands developer Through Games from releasing FRU, a downloadable puzzle platformer that requires heavy use of Microsoft’s motion sensor. The finished product, while not without its share of flaws, utilizes the Kinect in a way that is both unique and very clever, and may be worth a try for those interested in its concept. The very light plot has players control a small masked figure navigating through a series of temple-like levels, with a few lines of text at each one’s conclusion giving a tiny bit of backstory. Honestly, I found the plot so threadbare and muted that I don’t think the game would suffer without any of it, though it would have been nice for the on-screen protagonist to have a personality or at least a name. Where things get interesting is how the player incorporates themselves into the game. At all times, your colored silhouette appears on the screen, and the area this outline covers is affected in numerous ways that prove vital to beating each level. The campaign is divided into four levels, and each one showcases a different ability. These include making various platforms visible or invisible, having your outline be a body of water the protagonist can swim through, highlighting switches to alter the environment in various ways, and showing or hiding deadly lava. This often requires you to move your body and limbs in some pretty uncommon positions, sometimes requiring you to hold or very gradually change them to make sure the hero can survive. It’s important to note that in addition to posing, you still need to hold the controller and move them. Thankfully, the control scheme is appropriately simple, as you use either analog stick to move and either trigger button to jump, but it still makes for a bit of a balancing act at many points. 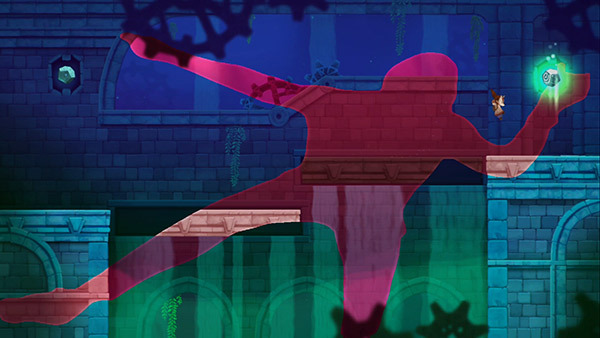 Like the best Kinect games, FRU is good at avoiding the issues of unresponsive and delayed controls the accessory has gained a reputation for. Fast-paced action gameplay is typically not the sensor’s strong suit, and Through seems to realize that. It helps that I didn’t encounter a single issue with my body’s inputs. There’s nothing about it that feels unpolished or sloppy. The game gets a lot of mileage out of its gimmick as well. With around a hundred individual screens to navigate, there’s a healthy amount of creativity on display. You’ll have to think outside the box pretty often if you want to beat the game. I spent a good 10 minutes stuck on one screen in particular, before realizing I could move my body closer to fill up more screen space. 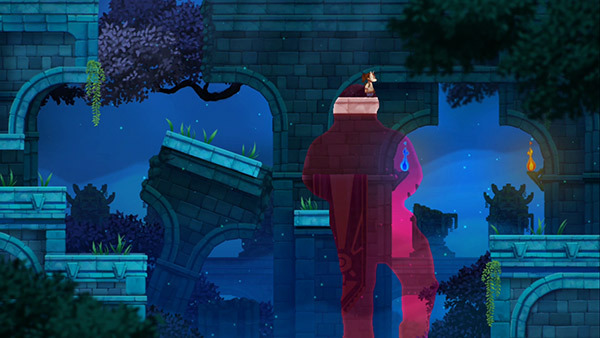 On the presentation side, the environments use an appealing but repetitive approach, with levels failing to deviate from the ancient temple theme. The soundtrack has appropriately mystical-sounding tracks, but they also fail to leave an impact. Again, it would have been a nice touch for the protagonist to have had something for me to latch on to. FRU has a smart hook that it utilized cleverly, but what drags it down for me is its length and something of a difficulty spike midway. I beat the campaign in about two hours, and the last two levels threw some situations at me with the switch and lava mechanics that I found more frustrating than fun, especially when I had to get in some uncomfortable positions for long amounts of time. In a weird way, the game both feels too short and outstays its welcome as a result, though this may be less of an issue for more athletic players. Completionists can certainly replay levels to collect 24 optional tokens that unlock a bonus level featuring co-op support, but other than some admittedly clever and intuitive achievements, there’s little that will entice players for a second playthrough. While FRU is a game that lost some of its appeal to me the farther I got into it, I still have a lot of respect for its ideas and the moments it nails that element. With the current fad in gaming switching from motion controls to VR, it seems unlikely that we’ll get a sequel that builds on the title’s better qualities, but hopefully Through Games can apply their creative spark to other genres in the future.